Since my last introduction to my choice of colours, I have altered the way I paint. On the back of the photo, the large palette is with colours Winsor Newton. This palette is used for Landscapes. 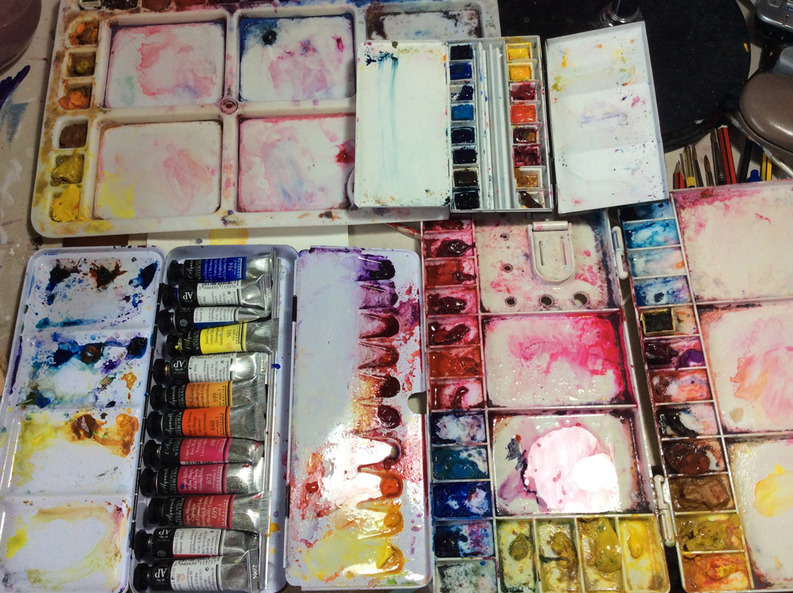 The very small palette is my field palette, for painting while out. The palette on the front left of the photo is Sennelier paint. Sennelier have a large choice and frankly, I did not know which one I would love to paint with. So I have chosen the palette Billy Showell is using for her flowers. I love them, although I find some reds on the sad tones. I prefer the singing ones, the ones with vibrant colours. The palette on the front right of the photo is uniquely for flowers. Some of my transparent colours with Winsor Newton.